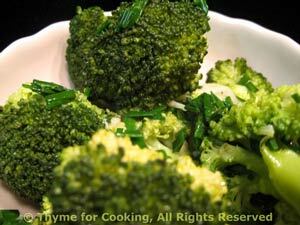 Broccoli with Butter, Herbs, Thyme for Cooking easy vegetable sides. Butter and fresh chives are a simple finish for broccoli. Any fresh herbs will work, but my choices would be chives or thyme. Use dried herbs when fresh are not available. Put in a steamer basket in a saucepan with an inch of water in bottom. Put on medium heat and steam for 10 - 12 minutes or until done. Remove from pan and set aside, discarding water. In same pan heat butter. Add chives and sauté lightly. Add broccoli and stir. Serve.